CHILLIES are a fun crop to grow. They are decorative, and don't take up a lot of space, so it's easy to grow a selection. Chillies originated in South America, and have spread throughout the world in the last 500 years or so. They are now an integral part of the cuisine of many different countries. The fruit usually start out green, and can be harvested at this stage. If left to ripen on the plant, the fruit will turn yellow, orange, purple, black or red, depending on the variety. The colourful, fully ripe fruit are generally hotter and have a more intense flavour than the green ones. Chillies enjoy similar conditions to tomatoes and capsicum. A warm, sunny position in a pot or garden bed is ideal. They don't need much in the way of care and attention. They are a warm season plant, and can look a bit shabby during winter. Chillies make good garden companions for eggplant, cucumber, tomato, okra, squash, basil, oregano and parsley. They also like geraniums, petunias, lovage, carrots and onions. Keep them away from beans, broccoli, cabbage and fennel. The heat of chillies varies greatly according to variety, from mild to ridiculously hot. The hottest chilli in the world is currently the Carolina Reaper. The Trinidad Scorpion and Naga Jolokia are not far behind. There is a new kid on the block, called Dragon's Breath, developed by a Welsh farmer and exhibited at this year's Chelsea Flower Show. 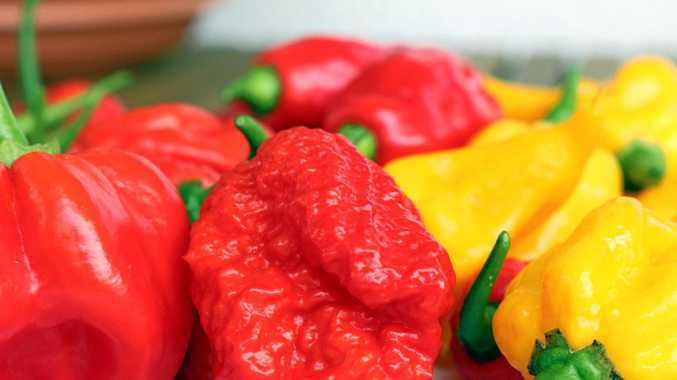 It has measured hotter than the Carolina Reaper, and the breeder is awaiting confirmation from the Guinness Book of Records that it is the new title holder. At the mild end of the heat scale, you will find Sweet Temptation. If you like something with a bit of bite, you might enjoy the jalapenos. A little further along are the caysan chillies, a fruit about 5-7cm long, which turn bright red when ripe. Habaneros are hot, and have an interesting lantern shape which might be orange, red, yellow or brown when ripe. Be careful when handling chillies, as the juice can be highly irritating to the skin and the eyes. If you are handling lots, or if you have sensitive skin, consider wearing gloves for protection.